The New York Public Library for the Performing Arts is pleased to announce the 4th year of ACROSS A CROWDED ROOM, our program to help musical theatre writers and performers find each other and create work together. Over the course of the summer, participants will meet each other and write a 20 minute musical which will be performed in the Bruno Walter Auditorium at Lincoln Center. There will also be opportunities to get feedback from masters of the art throughout the summer. Today’s subjects Bob Banghart and Georgia Stitt are currently living their theatre lives as the composers (Banghart and Stitt) and lyricist (Stitt) of what I consider to be one of the best new musicals I’ve seen in a good long while. I am referring to the Alaska-based world premiere musical Snow Child, now running through May 20th at Arena Stage. There are many reasons why I enjoyed Snow Child but one of the biggest reasons was the unique sound of the music. Read on to learn more about Alaska string bands. Banghart and Stitt’s score has as much variance as any you’ll hear in any theatrical score. It features big soaring ballads mixed with bluegrass which gives the score a down homey feel. It makes the audience feel totally welcome. With Molly Smith’s excellent direction, a dynamite production design, a stellar group of performers, a lovely book by John Strand, Lynne Shankel’s beautiful orchestrations, and the score by Banghart and Stitt, Snow Child is one of those shows that you all NEED to experience for yourselves. The show will soon be leaving town and headed to Perseverance Theatre in Juneau, Alaska. You only have until May 20th to experience one of the freshest things to ever hit the stage for yourself. Snow Child is one beautiful show and Bob Banghart and Georgia Stitt’s score is one HUGE reason for that. READ THE WHOLE INTERVIEW HERE. 11th Hour Theatre Company closes its 2017-2018 season with its MainStage production, Big Red Sun. This World Premiere musical, which the company helped develop is set to run May 31-June 17. Written by John Jiler& Georgia Stitt this emotional new musical will open Monday June 4 at 7 p.m. It is directed by 11th Hour co-founder and Resident Director Megan Nicole O’Brien with Music Direction by 11th Hour regular Dan Kazemi. 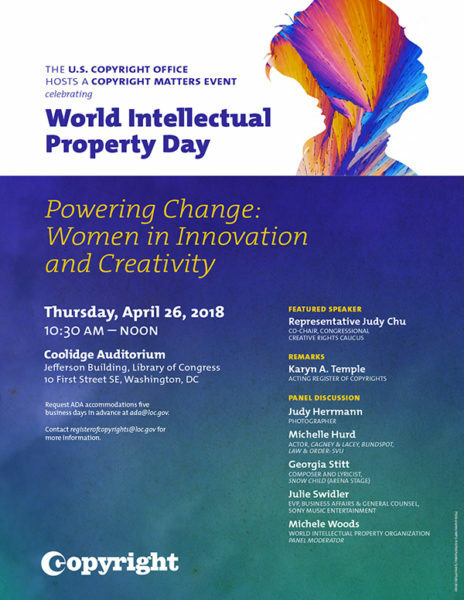 The Copyright Office’s program will feature an impressive array of prominent speakers discussing the myriad ways women have shaped creativity and innovation. Congresswoman Judy Chu, co-chair of the Congressional Creative Rights Caucus in the U.S. House of Representatives, will provide featured remarks. Michele Woods, head of the Copyright Law Division of WIPO will then moderate a lively panel discussion featuring Judy Herrmann (photographer), Michelle Hurd (actor, Cagney and Lacey, Blindspot, Law & Order SVU), Georgia Stitt (composer and lyricist, Snow Child), and Julie Swidler (EVP, Business Affairs and General Counsel, Sony Music Entertainment). Acting Register Karyn Temple will provide introductory remarks.